Driving record of offending motorist who claimed a "ghost car" caused Illinois bike crash. A driver with a long and troubled history of traffic violations tried to claim that it was a "ghost car" that caused a bicycle crash in August of 2015 that seriously injured two bicyclists. "Ghost cars" or "phantom vehicles" are terms that lawyers and police officers use to describe mythical cars that only drivers who are suspects in crashes conveniently see before a collision. "Ghost cars," like a mythical figure, only appear momentarily before disappearing forever. "Ghost cars" also drive erratically and force other drivers to swerve out of their way but unfortunately into something or someone else. The motorist who struck two Chicago-area competitive cyclists in late summer of claimed that the crash was caused by a "ghost car." The driver and the cyclist were traveling in the same direction on a major road in the far northern suburbs when the driver swerved over the fog line and onto the shoulder of the road where the two bicyclists were riding. The driver struck both bicyclists and caused serious injuries. Fortunately for the cyclists, there were two other witnesses to the crash and a responding police officer who wrote in his report that he did not find "credible evidence" of the ghost car. The problem with stories like this is that the insurance companies will often latch onto stories like this and use it as an excuse to delay a claim or deny it entirely while they "complete their investigation." In all cases an insurance company does have a duty and responsibility to investigate all claims. It's part of their job. But when the facts of the case are so overwhelmingly in favor of the injured person, the claim of an "investigation" becomes nothing more than an excuse to use the Three Ds Of Insurance Defense: Deny, Delay & Don't Pay. Our law firm was in contact with the responding police officer and the local county prosecutors' office right away. In the course of our investigation it was learned that the driver had received SIX separate traffic citations within five years. The driver was originally charged with a simple traffic violation, but Lake County prosecutors were encouraged by our firm and the responding police officer to pursue more serious charges given the extreme misconduct of the driver and the fact that serious injuries were sustained. The prosecutors made the decision to drop the misdemeanor traffic ticket and are preparing to file felony traffic charges against the motorist for the crash itself and his claims at the scene about the "ghost car." The improper lane change by this motorist on a state roadway violated Section 11-709 of the Illinois Vehicle Code. It is important to note that cyclists have the same rights on all state roads as motorists. Section 11-709 of the Illinois Vehicle Code states that “a vehicle shall be driven as nearly as practicable entirely within a single lane and shall not be moved from such lane until the driver has first ascertained that such movement can be made with safety. (625 ILCS 5/11-709). As evidenced by this collision in August of 2015, there was no dispute that it was unsafe for this motorist to move his vehicle from the left lane of Illinois Route 120 to the right lane and directly into the path of the cyclist himself and his bicycle, striking him and causing serious personal injuries. The injured bicyclist in this case was represented by attorneys Michael Keating of Keating Law Offices. The cyclist is a member of a local road bike racing team focused on road cycling and triathlon competitions. Given the extremely competitive nature of road bicycle racing, this cyclist will have residual negative effects of a decline in his training level that will permeate into the 2016 season. 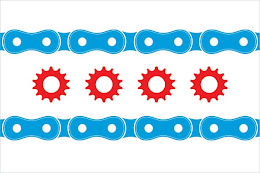 It was very important for the Illinois Bicycle Lawyers at Keating Law Offices to recover the maximum amount of money available from State Farm on behalf of this injured competitive cyclist and we are proud to have done so. If you have been injured in a bicycle accident, it is important that your get as much information as possible right away regarding your legal options. Keating Law Offices is the premiere personal injury law firm representing victims of bicycle accidents in Illinois. The firm is based in Chicago, Illinois and represents clients throughout Illinois. The firm is based in Chicago, Illinois and represents clients throughout Illinois. If you have any questions regarding this post or have a question regarding personal injury law, please contact Illinois Bicycle Attorney Mike Keating at 312-239-6787 (Office) or 312-208-7702 (Nights/Weekends). Our staff and operators are available around the clock. You can also email Mike@KeatingLegal.com 24 hours a day, 7 days a week. All e-mails and phone calls are returned promptly. All initial consultations are confidential and free.